"I have to eat like this. It's a race, and I'm losing." Stephen King seldom translates well to the movies. There was Carrie, and there was, well, there was Carrie. 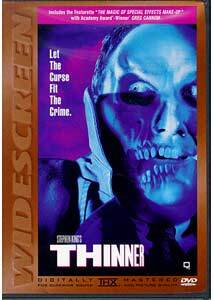 But Thinner is a decent second-tier effort that isn't really scary but manages to produce some suspense. 300-pound defense attorney Billy Halleck (Robert John Burke) accidentally runs over an old gypsy woman. Her ancient father, Tadzu Lempke (Michael Constantine) places a curse on Billy as well as the cop and judge who cover it up for him. Billy's curse is to grow thinner—by at least three pounds a day, no matter how much he eats. That's fine at first, but once it becomes clear that it's not going to stop until he's completely erased, Billy, with the aid of his Mafioso client Richie Ginelli (Joe Mantegna) tries to track down the old man to lift the curse. But Billy finds that Gypsy justice is not so easily diverted. The cast is more or less adequate. Constantine eats the scenery even more than Burke's character eats food. Mantegna seems to be parodying his usual mob role here, also going way over the top. Burke is decent in the lead, both sympathetic and despicable. Kari Wuhlers as Lempke's firebrand great-granddaughter is suitably steamy, and of course Stephen King himself shows up for a cameo. But the real star here is the makeup and effects. The fat suit that Burke starts off in is generally quite convincing, though it's rather excessive in a shower sequence. It takes a while to hit the really nasty gore effects, but when they do, it's pretty impressive. The effects by Oscar®-winning artist Greg Cannom really make this worthwhile. The thematic material is rather interesting as well. On first appearance, King seems to be taking the easy way out and maligning Gypsies, one of the few ethnic minorities that apparently can still be slurred with impunity. But before the end, it's clear that they, not the law and straight society, have a finer sense of justice. Constantine's final scene, in particular, involving a twitching pie, makes him one of the most sympathetic characters in the piece. The running time is about 25 minutes shorter than the 116 minutes indicated on the keepcase. Image Transfer Review: Since this disc was from the very early days of DVD, the transfer is pretty poor by modern standards. The picture is nonanamorphic and highly pixelated, with substantial blockiness. Colors are good, as are black levels, though the director in the commentary complains that the brightness levels are far too high in some of the gorier sequences. Detail that he indicates we're not supposed to see is plain as day. Audio Transfer Review: In contrast, the 5.1 Dolby Digital audio sounds terrific. There is good definition with active surrounds, and good bass levels to boot. Dialogue is crisp and clear throughout, and the music sounds natural and undistorted. No hiss or noise to be heard either. Extras Review: The commentary from director Tom Holland and costar Joe Mantegna has some good moments, but they have an annoying tendency to narrate the picture or to explain things that are perfectly clear on first viewing. A few good anecdotes and background on the effects are provided, so it's not a complete loss. A better extra is a documentary (20m:07s) about Greg Cannom's makeup and effects work, with the fat suits and appliances being used on the various characters. There's also a fair amount of behind-the-scenes footage in the makeup chairs. A good deal of the information here is repeated in the commentary, so one can watch the documentary and skip the commentary and not feel like you've missed anything significant. No trailers, but chaptering is very good. That rare thing, a decent adaptation of a Stephen King novel, in a substandard video transfer but a first rate sound track. The extras are sizable but somewhat lacking in substance.